This weekend we shall be lazy, and enjoying all of the celebrations around the Jubilee. Well, really the main thing we will enjoy is the extra day off! However, as an American dating a Brit who is not keenly enamored of the Royal Family, we have come up with a few activties that don’t involve Royalty. Strawberry picking on Saturday to follow with a homemade jam making session. Sunday we are planning on an 8 -10 mile ramble through the beautiful countryside around York (if anyone has a favorite walk, we would love to hear about it?). Monday is a picnic at Beningbrough Hall along the banks of the River Ouze and Tuesday we are wrapping up with an all day gardening session at Tony’s house. Hmmm…not so lazy after all! Actually we are going to try and squeeze in some time to watch the Swedish version of ‘The Killing.’ Tony fell in love with the sries and has agreed to watch it again with me as I missed it. We also grabbed the ‘Game of Thrones’ season 1 from HBO and Season 1 of ‘The Walking Dead.‘ Stacking up to be a massive television marathon. I am posting all of this to remind myself of all of our plans when I wake up at 8:00 on Saturday and desperately want to stay in bed for a few more hours. One final note…AMERICA you have been missing out! 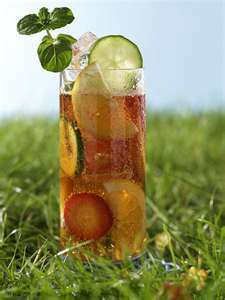 This whole Pimm’s thing?!? Why are we not doing these drinks for our celebrations? They are yummy!